Is there any reason why you can’t (or wouldn’t want to) use the electric starter to turn the engine over, but use magneto power to provide spark (key on MAG)? I don’t know why anyone would want to do it but a friend asked me the question and I gave him the deer in headlights look because it’s not something I ever considered. I dont see why not. Believe the spark lever has to be down a few notches, like always when starting on mag, if your timing is set properly. No reason not to at all depending on the mags condition and the cranks end play. Under perfect conditions the mag would supply ample power to fire the coils with hand cranking. More with an electric starter as the engine will be turning faster than by hand. That's how it was designed to work. A number of conditions decreases mag out put like excessive crank end play enlarging the coil/magnet gap causing less output equals harder starting. After rebuilding my coils and having them HCCT'd my '23 started, dead cold on mag hand cranking. Works, no different then hand cranking only it turns a little faster. But it would also depend on how strong your magneto is. I have done it a number of times, you are not going to hurt anything. If you read the owners manuals on how to start, key on mag even with an electric starter. If you start on mag you won’t have to remember to turn to mag. No reason not to hand crank on mag. I almost always forget to turn to mag after starting. In the case of a low battery, it may even be beneficial. I could believe there is a point at which the starter is robbing all the battery power and spark could suffer. Using mag, would make sure you had spark even if the battery was all being sucked up by the starter. Thanks all. My magneto works great so I’ll give it a shot sometime. Gee, have I been doing it wrong this whole time? What was the point in even providing a battery position for the switch if this was Ford’s position on the matter? It doesn’t affect operation of the starting motor. The electric starter was a help for those that had difficulty using the hand crank. Women could now get the car going without help and from inside when the weather was bad. My cordless phone works when the corded one is more than ten feet from the wall, it is a convenient thing we all get used to and than it becomes the norm. I have started the '25 with the key on MAG by accident a few times after I stalled while driving. It works for me. So I tried starting my car last night with the starter while the key was on mag. It would not start. I didn’t even hear the intermittent buzz-buzz-buzz of the coils. As soon as I turned the key back to battery, I got a free start. I recently had the engine out to replace a cracked drum. The field coil was rewound and the magnets charged the last time the engine was out about 15 years ago. The strange thing is the car runs great on magneto once running. I can set it at bare minimum idle and full retard and the engine will just tick-tick-tick over on mag. This makes me think it’s not an issue of the magneto being weak. Performance at high speed is also good. The one unknown I have are the coils. I bought a set of them from a flea market vendor at Hershey many years ago (not from one of the rebuilders that I can recall) and I put them in the car and that was that. I have no idea if they’re adjusted correctly or the state of the internals. I’ve been wanting to get them rebuilt or at least checked out for a while now. Any thoughts as to whether coil performance would be a factor here for the car not starting on magneto? I start my 23 with electric starter and set on mag all the time and I drive the car daily. But when I rebuilt the engine last year I installed a rebuilt coil and I recharged the magnets. In fact ... I did the initial start of that engine hand cranked on mag. 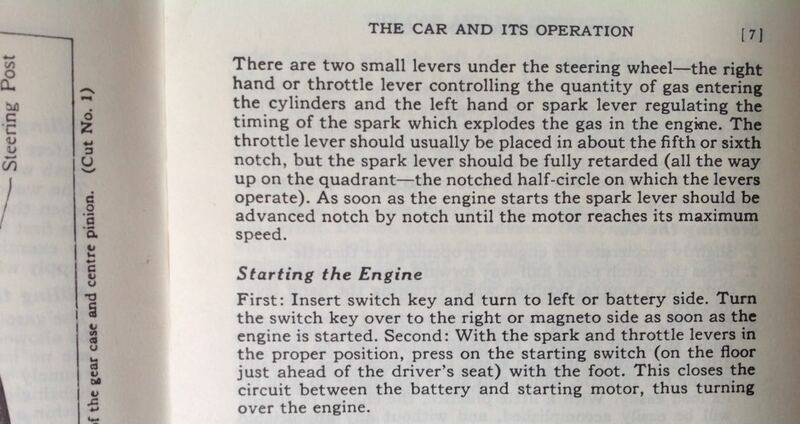 The manual for my ’26 instructs one turn to battery first and as soon as engine starts, switch over to magneto side. Apparently, both methods were approved per the Instruction Book over the years.